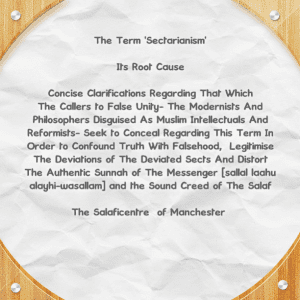 When the Salafiyyoon refute all the people of Bidah and refuse to co-operate with them, the callers to false unity accuse them of causing disunity and sectarianism in their desperate attempts to conceal the true reality of this term when applied in its right context. Imaam Ibnul Qayyim [rahimahullaah] said: ‘’When a proof that supports the truth is manifested and the one who wants to repel it finds no way of doing so, he refrains from mentioning it and thus becomes a silent devil, and sometimes he distorts it. Distortion is of two types: Distorting words and distorting meanings. Distorting words is when one utters a word in a context in which it does not establish the truth – either adding to the word or omitting something from it, or substituting it with something else- to the extent that the listener is made to believe something, whilst something else is intended by it, just as the Yahood [i.e. those Yahood who disbelieved in the Prophet & hated him] used to distort words when giving Salaam to the Prophet [i.e. saying As-Saamu Alayka (death be upon you), instead of saying Assalaamu alaykum)]. This is one type of distortion. The second type of distortion is related to meanings – distorting the wording; giving it an interpretation that is not intended by the one who uttered it and pretending not to know its unintended meaning; or dropping other meanings intended by it etc. Allaah [The Most High] said: [وَإِن تَلۡوُ ۥۤاْ أَوۡ تُعۡرِضُواْ فَإِنَّ ٱللَّهَ كَانَ بِمَا تَعۡمَلُونَ خَبِيرً۬ا – and if you distort your witness or refuse to give it, verily, Allah is Ever Well-Acquainted with what you do]. The cause of the differing that take place between the callers is the differing in methodologies. And had the callers (may Allaah guide them and grant them success) followed a singular methodology- the methodology of the Messenger (sallal-laahu-alayhi-wasallam; that which the Messenger (sallal-laahu-alayhi-sallam) and his companions were upon- then these differences would not have occurred. The political parties [or groups] emerged in this era [whilst] affected- to some extent- by the creed and methodologies of [the khawaarij]. And for this reason they do not give importance to [other affairs] besides politics. They do not give any concern to rectifying the situation of the Ummah though [sound] Creed and Knowledge, nor do they reflect upon returning the Ummah to the Book and the Sunnah and the piety and steadfastness the Salafus Saaleh were upon in every aspect of the Religion. Rather they [i.e. these political parties (or groups)] increase the Ummah in corruption upon corruption-in creed and manners. 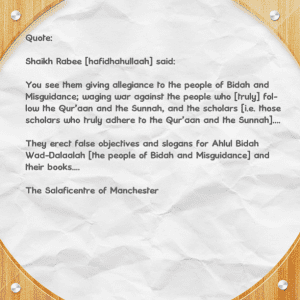 So, you see them giving allegiance to the people of Bidah and Misguidance; waging war against the people who [truly] follow the Qur’aan and the Sunnah, and the scholars [i.e. those scholars who truly adhere to the Qur’aan and the Sunnah]. They erect false objectives and slogans for Ahlul Bidah Wad-Dalaalah [the people of Bidah and Misguidance] and their books; and amongst them [i.e. these people of bidah] are Sayyid Qutb and his followers – the one [i.e. Sayyid Qutub] who set out upon the stratagem of the Khawaarij, the Rawaafid, the Mu’tazilah and the Jahmiyyah in creed, methodology and politics; especially in the subject matter of Takfeer based on oppression and ignorance. According to him all human societies are societies of Pre-Islamic ignorance and the Muslim Ummah is the severest in its apostasy and Pre-Islamic state of ignorance. Thereafter, the path of the Baatiniyyah was added to this, [such] as assassinations, blowing up [buildings, people etc]. Then his followers attribute themselves to the Salafi Methodology based on a mighty plot against the [true, upright] leaders [of the Salafi Methodology]. [Therefore], when you come to know this, you will know that the Salafi Methodology is free from this [type] of Takfeer, [the evil act of blowing up buildings, people] and destruction; and you will know who the treacherous people are. If you know this, then it is tantamount to an act of manifest oppression when the Raafidah, the Secularists and Rationalists attribute [terrorist acts], [false] Takfeer and destruction to the Salafi Methodology. 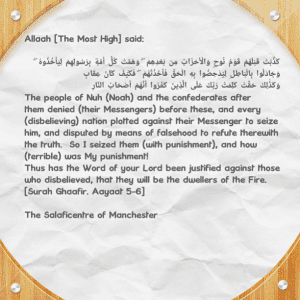 Allaah [The Most High] mentioned -in this Aayah- those who argue against His Aayaat to nullify them [i.e. they argued against Allaah’s Aayaat to declare them false], just as the previous nations before them did, such as the people of Nooh, Aad and those confederates who formed an illegal partisanship, gathered against the truth and to aid falsehood, until they reached [that state, which is]: [وَهَمَّتْ كُلُّ أُمَّةٍ بِرَ‌سُولِهِمْ لِيَأْخُذُوهُ -And every (disbelieving) nation plotted against their Messenger to kill him]. This is the [most dangerous situation] the Messengers can find themselves in- the ones [i.e. the Messengers of Allaah] who are the [only perfect] leaders of the righteous people and possessors of pure truth about which there is neither any doubt nor ambiguity; however, they [i.e. their disbelieving peoples] plotted to kill them. Is there any [act] of rebellion, misguidance and wretchedness that [can be severer] than this?! So, for this reason [the plotters deserved] a great punishment which they cannot escape. Allaah [The Most High] mentioned the punishment they [received] in this worldly life and what they will [receive] in the afterlife: [فَأَخَذْتُهُمْ -So I seized them]-Meaning: [Destroyed] due to their act of wilful denial [i.e. their wilful denial of Allaah’s Aayaat by way of arguing with falsehood and plotting to kill Allaah’s Messengers] and their illegal partisanship. [فَكَيْفَ كَانَ عِقَابِ- And how (terrible) was My punishment!] [وَكَذَٰلِكَ حَقَّتْ كَلِمَتُ رَ‌بِّكَ عَلَى الَّذِينَ كَفَرُ‌وا أَنَّهُمْ أَصْحَابُ النَّارِ‌ -Thus has the Word of your Lord been justified against those who disbelieved, that they will be the dwellers of the Fire]. 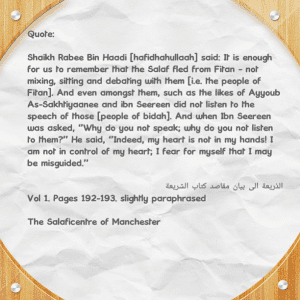 Shaikh Rabee Bin Haadi [may Allaah preserve him] quoted Imaam As-Saabooni [rahimahullaah] who stated: ‘’And they [i.e. Ahlul Hadeeth] hated Ahlul-Bid’ah – those who initiated into the religion what is not from it. They neither loved them nor keep company with them. They neither listened to their speech nor sit with them. They neither argued with them about the religion nor debated with them’’. Then Shaikh Rabee said: How is this [the case]? Is this [view introduced] from themselves or guidance from Allaah and His Messenger, and that which the Salafus Saaleh were upon? Allaah [Glorified and Exalted be He] warned against Ahlul Bidah and clarified for us that they are people of desires, and that they follow Mutashaabihaat [i.e. texts that are not entirely clear in what they indicate, so they are referred back to other texts to be explained] and they abandon the Muhkamaat [i.e. texts that are very clear]. [وَجَادِلْهُم بِالَّتِي هِيَ أَحْسَنُ – and argue with them in a way that is better]. This is the legislated debate. Allaah did not close the door of debate completely, so if we have a way of establishing the proofs and to guide the people to good, we follow it. The one who is debated with may not benefit but others may benefit. As for the weak one, then no [i.e. he does not engage in debate]. Even amongst the scholars there is one who is weak and one who is led to be mistaken by Shub’hah [i.e. a statement or affair that resembles the truth but is falsehood in reality]. He may be a scholar but his character is weak, so he becomes weak in the presence of Ahlul bidah, even if they are younger than him and lesser in knowledge! Indeed, it has happened to many of those who ascribe to the Sunnah and Hadeeth [ i.e. fell into some deviation or error] due to their weakness and opposition to the methodology of the Salaf. For example: Al Bayhaqqi was from the seniors of Ahlul hadeeth and their scholars, and was deceived by some of the Ashaa’irah such as Ibn Fawrak and his ilk, so he fell into Ash’ariyyah! 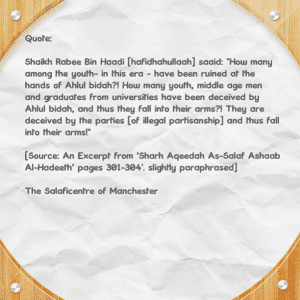 How many among the youth- in this era – have been ruined at the hands of Ahlul bidah?! How many youth, middle age men and graduates from universities have been deceived by Ahlul bidah, and thus they fall into their arms?! They are deceived by the parties [of illegal partisanship] and thus fall into their arms! Why is this? Because they did not act upon the statement of the Messenger: ‘’’If you see those who follow thereof that is not entirely clear, then they are those whom Allah has named [as having deviation (from the truth)] so beware of them’’. The strong one calls Ahlul bidah; he calls the Christians. There has to be dawah in the path of Allaah and there has to be strong scholars who disseminate the religion of Allaah; and when necessary, they debate so that the proofs are established and benefit one who is to benefit. [The word (ظلم –wrong) in (this ayah) can (mean) disbelief; it can (mean) bidah and it can be (فسوق i.e. sinful, immoral behaviour) because (ظلم) is applicable to all these (things)]. Therefore, we refrain from inclining towards the evil doers, the people of bidah, the disbelievers, the secularists and other than them. And we protect ourselves, our Aqeedah and that which Allaah has bestowed upon us of Imaan and sound religion. So the likes of these Imaams feared fitna and deviation for themselves; but you the Miskeen possess that bravery that enables you to challenge ahlul bidah….!!! Many people say, ‘’We sit with ahlul ahwaa [i.e. the people of desires] and we take [from them]; we distinguish between truth and falsehood; we take what is truth and abandon falsehood’’, whilst he [i.e. the utterer of this speech] is a Miskeen who can neither distinguish between truth and falsehood nor is he in control of his heart. 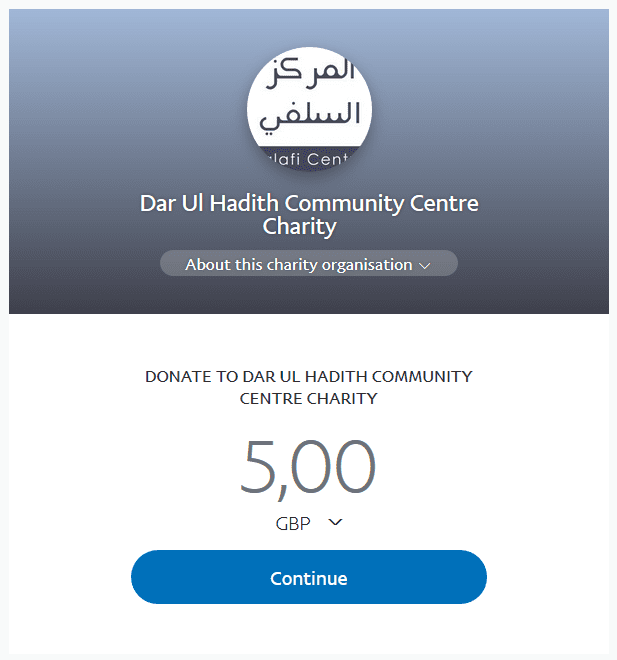 How many a young person has been put to trial through this satanic view and thus he [becomes] degraded, reverts back on his heels [into misguidance] and depraved, and Allaah’s Aid is sought. He falls prey in the arena of the people of fitan! Therefore, it is obligated on a student of knowledge not to [regard] himself safe from ahlul bidah, for indeed he is not more knowledgeable than Ayyoub and Ibn Seereen, nor can he reach their station [in knowledge, piety etc] and those who followed them. 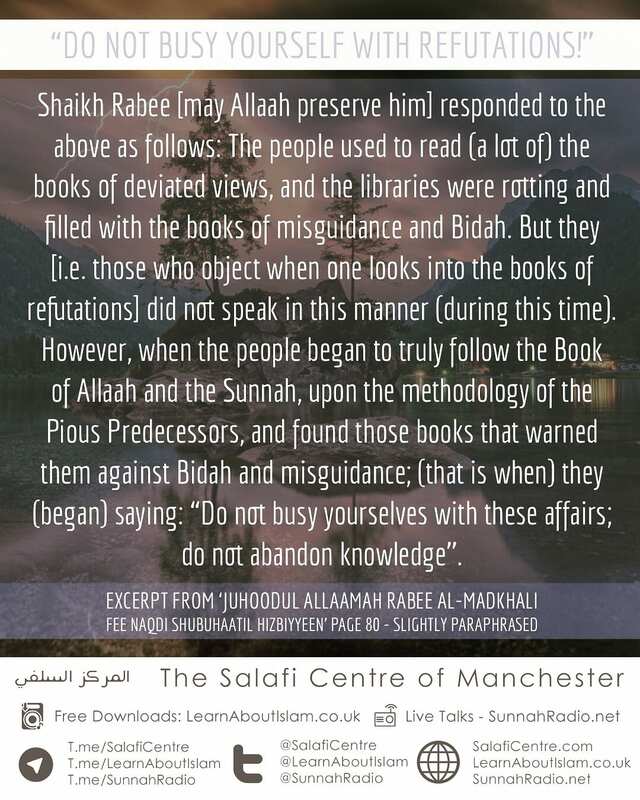 Shaikh Rabee [may Allaah preserve him] responded to the above as follows: The people used to read -a lot- the books of deviated views and the libraries were rotting and filled with the books of misguidance and Bidah, but they [i.e. those who object when one looks into the books of refutations] did not speak in this manner. However, when the people began to [truly follow] the Book of Allaah and the Sunnah upon the methodology of the Pious Predecessors and found those books that warned them against Bidah and misguidance, they said, ‘’Do not busy yourselves with these affairs; do not abandon knowledge’’. Shaikh Rabee then said: These refutations are from the affairs of knowledge. To be acquainted with guidance and [distinguishing it] from misguidance; acquaintance with good and [distinguishing it] from evil -by Allaah – is from the knowledge that will protect [a person], just as Hudhaifah [radiyallaahu-anhu] said, ‘’The people used to ask the Messenger of Allaah about the good, but I used to ask him about the evil out of fear of falling into it’’. The books of the people of Bidah and misguidance must be known by way of the books that refute them. Therefore, unless this happens, then [one must know that] many of the youth were not ruined except when they were deprived of the likes of these books that protect them. There is a means of protection for the youth in these books [i.e. the books written by the scholars to refute errors, misguidance and ahlul bidah etc].